We caution you to be wary of placing shipment bookings with unlicensed & inappropriate agents, some of whom operate out of a Facebook account and may be blacklisted. 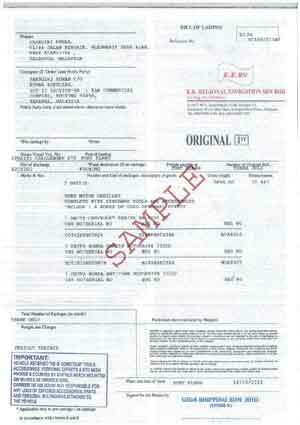 Marine Law stipulates that, vehicles can only be released by the Shipping Line, once freight & other charges are fully paid for by the Booking Party, who in return, receives the Bill of Lading; a document which is exchanged for the 'Delivery Order' at the Port of Discharge, to initiate the release of your vehicle. We often encounter issues, as these agents almost always consolidate your vehicle with that of other vehicles and may accumulate up until 50 or more vehicles under one Bill of Lading. If payments are not settled with the Shipping Lines, the Agent is not provided with the Delivery Order and hence all units under the Agents' Bill of Lading are kept on hold. 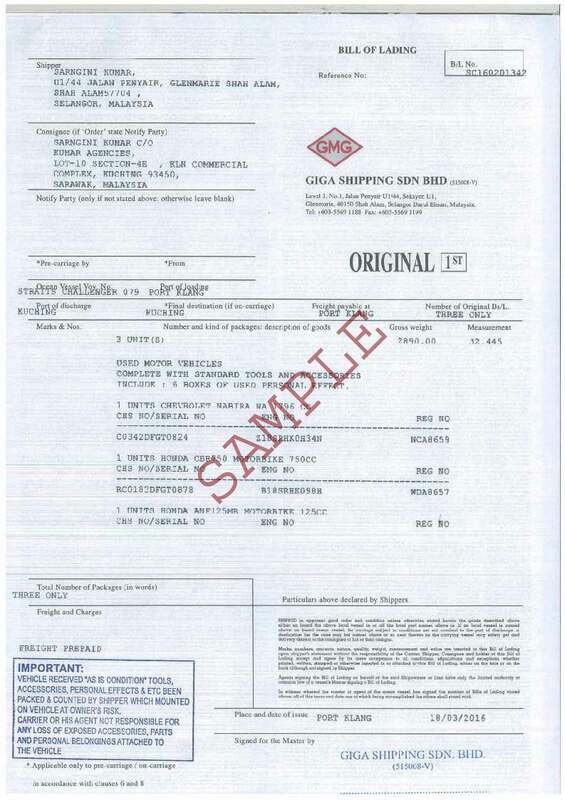 This may lead to displeasure if you have settled payments with the Agent, but the Agent has not in turn settled their payment to the Shipping Line. We respect your decision to use Agents when placing shipment bookings, however please do ensure certainty of your Agent's background. 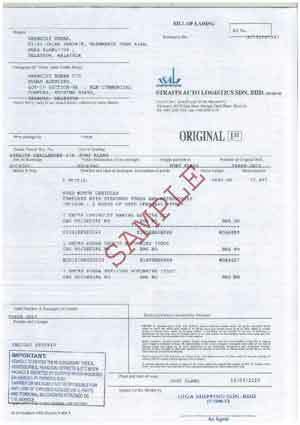 However, should you wish to proceed by placing a booking through the Agent, please request for your very own copy of the Bill of Lading once you make payment for your cargo. Your name should appear as the Shipper & Consignee in the Bill of Lading. 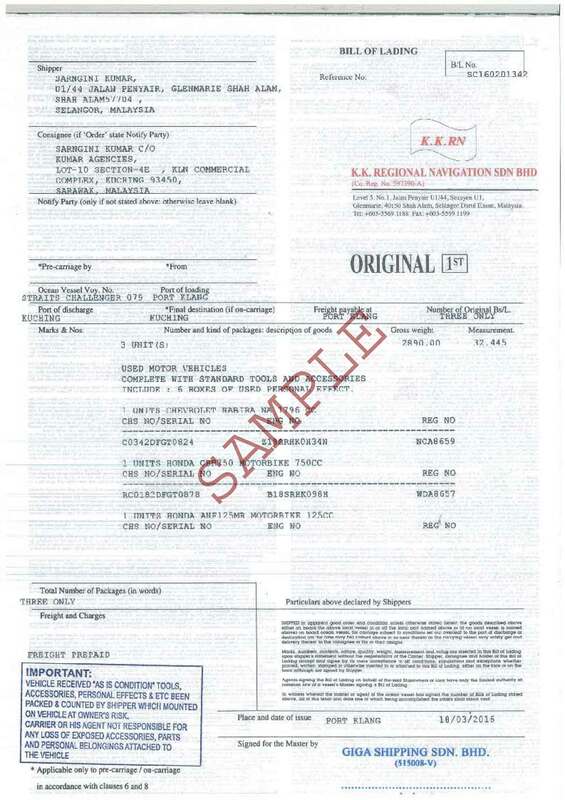 This is similar to a passport for your vehicle and we are unable to release your vehicle/s, unless the Bill of Lading is presented. Please note that Roll-On Roll-Off Bookings on our voyages will be issued with an official Bill of Lading from the following Shipping Lines only, Giga Shipping BL, Straights Auto Logistics BL & K.K.R.N BL.